We have spent some time with one of the most interesting at the show so here is Philips 8900 AmbiLux. The idea is that AmbiLight changes color based on, what is on the screen so a nice landscape scene will glow green at the bottom where there’s grass and blue at the top where there is sky. Until now it is consisted of LEDs mounted along the sides at the back traditionally on the left and right but also available in 3 sided and 4 sided set-ups. It is a 105-inch projection at the rear so it is much bigger than normal AmbiLight making the experience bigger and better. 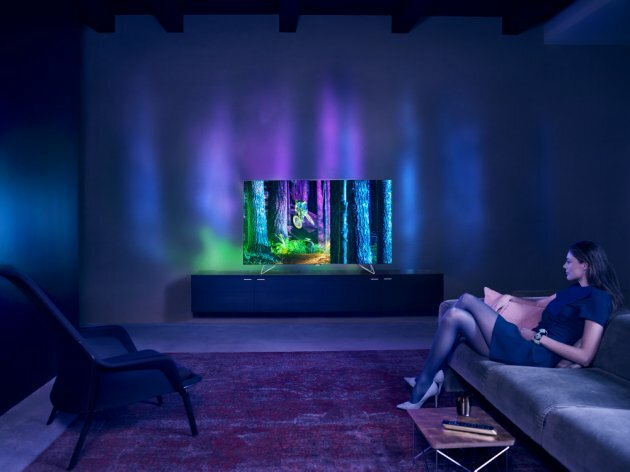 A video processor in the TV tells each projector what to do and instead of simply shining the correct colors like existing AmbiLight, the AmbiLux mimics whatever is on the screen. It is hard to go back and TVs without it just seem a little odd. One thing which the AmbiLux is able to do is give the effect of objects continuing off the edge of the screen. While the AmbiLux technology is really immersive for TV and film, it isn’t quite so ideal for gaming and some users may find it distracting when trying to line up a headshot or similar. We do not know for sure as we were only able to watch demo reels which contained a small amount of gaming. We are excited to get hands on AmbiLux which is a natural upgrade for those already using AmbiLight. It’ll, for now, only be available on one model though which is the 8900 characterizing a 65in 4K display and Android. It is difficult to distinguish in the world of TVs but Philips has done a very good job here with the follow-up to Ambilight LED technology.